Within the UK we have 18 species of bat in the UK, 17 of which are known to be breeding here – that’s almost a quarter of our mammal species. A bats home is called its roost. Bats need different roosting conditions at different times of the year and they will often move around to find a roost that meets their needs. Some bats prefer hollow trees, some like caves and some use both at different times. Many bats shelter in buildings, behind hanging tiles and boarding or in roof spaces. 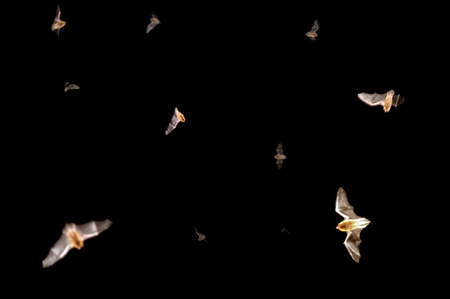 For several weeks in summer, female bats gather in a maternity roost to have their babies. In winter, bats use hibernation roosts. Bats have been discovered roosting in all sorts of places, but there are three broad roost types that are the most common: roosts in trees, roosts in built structures and roosts in underground sites. Bats may also roost in bat boxes. Preliminary Roost Assessment involves a licensed and experienced bat consultant to initially conduct an internal and external inspection of a building/structure/tree to identify any potential roosting opportunities and signs of bats, coupled with this the landscape on site and in the surrounding area, it will all be considered when conducting the Preliminary Roost Assessment. As part of the Preliminary Roost Assessment a desktop study will also be conducted, which will involve contacting the Biological Record Centre and general website-based investigation. Dusk and pre-dawn emergence surveys of buildings and trees are conducted to identify roosting bats using a building, structure or trees. This allows us to identify the best bestboke mitigation compensation that is workable for the client as well as the bats and apply for a development licence. During the bat activity survey suitably qualified and experienced bat surveyors will be positioned around the buildings, structure or trees to identify if bats are potentially using the them as a roost. Following on from this we can identify the species, number and roost type. The surveys will be conducted at dusk or in the hours before dawn. All our bat ecologists use the state-of-the-art detectors that can be left at a site to monitor bat activity for weeks or months between surveys. During our surveys we use infrared cameras with infrared spotlights to record bat’s behaviour. All our bat surveys conform to the Bat Conservation Trust Best Practice 2016 3rd Edition. For sites that are going to have an impact on potential commuting and foraging habitats such as the removal of hedgerows/ trees or loss of grassland or water features. We would conduct a walked route around the site stopping at specific points (listening stations) to record bat activity around the site using bat detectors and remote static detectors to record bat activity when surveyors are not present. Dependant on the size and quality of the habitats, surveys can range from three visits and up to fourteen visits. In England and Wales, the main legislation pertaining to bats and development is the Conservation of Habitats and Species Regulations (2010) where bats are European Protected Species. However, bats are also protected by the Wildlife and Countryside Act (1981) (as amended), the Countryside and Rights of Way Act (2000) and the Natural Environment and Rural Communities Act (2006). In Scotland, the key legislation that applies to bats is the Conservation (Natural Habitats &c.) Regulations 1994 (as amended). In Northern Ireland, bats are listed under Schedule 2 of the Conservation (Natural Habitats etc) Regulations (Northern Ireland) 1995 and, in the Republic of Ireland, under Schedule 5 of the Wildlife Act (1976) and Schedule 1 of the European Communities (Natural Habitats) Regulations, 1997.